We do not sell aronia seeds. You can either purchase seeds from nurseries that sell them or you can extract seeds from aronia fruit yourself. This post includes a list of businesses that that sell aronia seeds. To view that list, click on the title of this post or the words "Read more" below and to the left of the picture. To purchase seeds, you can also click on the Amazon ad entitled "Black Chokeberry Tree Seeds" shown in the right column when you scroll down on this page. One way to extract the seeds from aronia berries is to place the fruit into a Ziploc bag, seal, and mash the fruit through the bag with my fingers. Then let the fruit decay for a few days, mashing the fruit periodically. After a few days to a week, the pulp will have decayed from a firm substance to a fairly watery one. Fresh aronia berry pulp tends to cling tenaciously to seeds; rotted pulp tends not to. Dump the mass of pulp and seeds into a large bowl and fill 2/3 with clear water. Rub the pulp/seed around with your hands, squeezing and rubbing the seeds to remove as much as possible. Place the pulverized pulp and seeds in a jar half-full of water. Put the lid on the jar and shake it vigorously. Do this several times. The viable seeds will tend to sink, while the lighter pulp will tend to float. Carefully pour off most of the water and pulp. Refill the jar and repeat several times. If all goes well, you'll have a collection of clean seeds at the bottom of the jar. If the pulp is especially tenacious and difficult to separate from the seeds, then a quick trip in the blender along with 1/2 cup water or so will usually remove stubborn pulp. Quick bursts are best and be careful not to overdo it, as damaging the seeds is a concern with this method. After the pulp has been adequately removed, fill the jar of seeds with 1 part hydrogen peroxide and 5 parts water. Hydrogen peroxide is a mild disinfectant. Shake the jar for a minute or two, rinse thoroughly, and your seed is now clean. 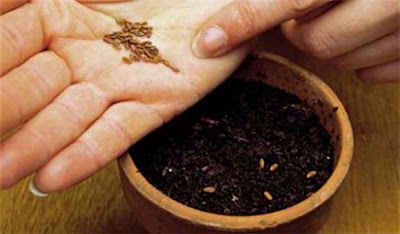 Seeds should be thoroughly dried before storage and subsequent planting. Seeds can be planted immediately in the fall or given 2 to 3 months of cold stratification. The seeds’ internal dormancy can be overcome by stratification in moist peat for 3 to 4 months at 32-41 degrees Fahrenheit before planting. Viking, Nero, and several other aronia cultivars will come true from seed. That’s because they have a high degree of apomixis. This means that aronia cultivars reproduce from unfertilized seeds (apomictic seeds). The embryos grow from somatic cells, not from fertilized egg cells. The seedlings are genetic duplicates of each other and their parent. In other words, they are clones. It also means that these aronia cultivars do not require self-pollination or cross pollination for fruit production. However, seedlings grown from aronia cultivars should only be referred to as seedlings of the parent cultivar. For example, plants grown from Viking seeds should be called seedlings of Viking or Viking seedlings. 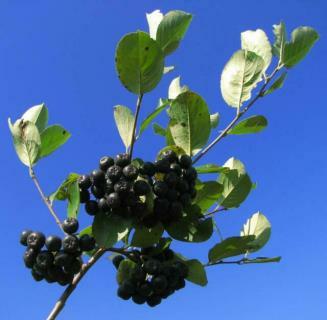 Genetic tests, done by Dr. Mark Brand at the University of Connecticut, have indicated that the popular aronia cultivars Viking and Nero probably resulted from cross pollination of Aronia melanocarpa and Sorbus aucuparia. In other words, Viking and Nero have some genes that came from European mountain ash. In fact, the genus Sorbus has the ability to easy cross with other genera in the Rosaceae family. Genes from European mountain ash may account for some of the unique characteristic expressed by Viking and Nero. But there are other reasons that may also explain why they are so different from wild aronia plants. Viking and Nero are polyploids rather than diploids like the wild species, Aronia melanocarpa. Diploid plants have two sets of chromosomes but polyploid plants have more than two complete sets of chromosomes. In fact, many cultivated crop plants and ornamental landscape plants are polyploids. Their wild relatives are often diploids but wild species can also be polyploids. Botanists estimate that about three fourths of flowering plant species are polyploids. Most polyploid plant species arose as a result of hybridization between two species, followed by repeated self-fertilization. Polyploid plants often have characteristics that make them commercially more valuable than the corresponding diploids. In general, polyploid crop plants and polyploid ornamental plants are larger and more robust than their diploid relatives. They often have sturdier stems, thicker leaves, and larger fruit. Their flowers are bigger with thicker petals and they last longer. Polyploid plants often produce more fruit or grain than their respective diploid wild species. Many cultivated polyploid plants reproduce more easily by asexual means as compared to their diploid relatives. But diploids tend to reproduce more easily by sexual means (seed). Polyploid cultivars are often partially sterile and seed production is reduced. Viking, Nero, and several other aronia cultivars have a high degree of parthenocarpy. This means that they set fruit without pollination or fertilization and, consequently, most of the fruit is seedless or only contain a few viable seeds. 3. Refrigerate the seeds for 3 to 4 months at 33 to 41 degrees Fahrenheit. After the aronia seeds are stratified, plant them no more than one-quarter inch deep in a container filled with a moist, well-drained germination medium. Cover with glass or plastic and keep the container moist, but not soggy. Aronia seeds should germinate in 3 to 4 weeks at 70 to 75 degrees Fahrenheit bottom heat. As soon as the seeds germinate, place them under bright lights or move them to a greenhouse or cold frame. For nursery production of seedlings, plant aronia seeds outdoors in well prepared beds in September. If it does not rain, then water the seedbeds before the ground freezes. The seeds will naturally receive cold treatment during the winter. The aronia seeds should start to germinate when the seedbed warms up in the spring. When a nursery propagate aronia plants from seeds, they may unwittingly misidentify the seed or seedlings by labeling them with the seed parent’s name. Or they may simply list them for sale as aronia seeds or aronia seedlings. If that is the case, then you might want to ask the nursery for the name of the parental plant. For example, if the seeds are being sold as aronia seeds, then you might want to ask the nursery if the seeds came from Viking, Nero, or some other source. If you have experience growing aronia seeds or if you have questions about growing aronia plants from seeds, then please post a comment in the box below. You might have better results by planting aronia seed in an outdoor seedbed, greenhouse, or high tunnel. When the seedlings are large enough to handle, they can be transplanted to the field. This has several advantages when compared to direct seeding. The seedbed can be protected from wind, direct sunlight, deer, rabbits, etc. The seedbed can be watered by hand or with sprinklers set to automatically turn on and off with a timer or some other device. The soil in the seedbed can be specially prepared for better seed germination. The disadvantage is that you will need to transplant the seedlings to their permanent location in the field. If you were to plant seeds in large terrariums to be transplanted into a field when big enough, would you keep the terrariums indoors or outdoors? Also, would you still soak them first and what should the seed spacing be? Thanks for all of your wonderful information! I posted the earlier question but also meant to ask this: Would it be better to plant seeds in terrariums now (Sept) and set outside where it can be stratified somewhat naturally, or refrigerate seeds and plant in terrariums in the spring to be transplanted to field in the fall or following spring. Thanks!! Aronia seed can be planted outdoors in the fall. But without protection, many of the seeds may die from natural causes. This is the reason why plants that rely mostly on seeds for reproduction make so many of them. It’s insurance. Some of the seeds may get eaten by birds and other critters. The seeds may get too wet and rot. After they start to germinate, they may dry out and die. But you can provide some protection by planting aronia seed in a cold frame or other enclosure. Before artificial refrigeration, natural cold was the best way, if not the only way, to provide the needed stratification. Now we can provide protection from critters and weather extremes with a refrigerator. The cold stratification process can also be more precisely controlled. So, using a refrigerator is better than natural cold treatment. Begin by pre-soaking your aronia seeds overnight. Then sow the seed close together in rows. The rows should be about one-half inch apart. The germination medium should be moist (but not wet), loose, well-drained, and disease free (pasteurized). After sowing the seeds, place the container in a plastic bag to keep the germination medium from drying out. Then place the container in a refrigerator and stratify the moist seeds for 3 to 4 months at 32 to 41 degrees Fahrenheit. I am considering planting Aronia seeds outdoors in plastic mulch with drip irrigation. Do you think the seeds will germinate ? We are in a cold climate. Some of the seeds will probably germinate. I have pick up some seeds last week. I am actually soaking them. Some are floating others not. Do you think that I can sort the good from the abd seeds using this method? Viable aronia seeds are often denser than water and, therefore, sink in water. Empty seeds will float. However, some seeds that are viable will also float until they imbibe water, then they sink. Once you have soaked the seeds in water, you should plant them right away or stratify them if they haven’t already been stratified. Aronia seeds need cold, moist treatment. Stratification simulates natural winter conditions that aronia seeds must have before they will germination. The seeds do grow from the frozen Aronia fruit. I use twenty seeds and all twenty seeds sprouted. I'm sure that if I used more seeds they will all sprouted,but I don't need that many plants.It was a fun because I like to experiment and observe how plants grow. Thanks for the very valuable information on your blog. How long it going to take for the aronia plant to have fruit if I start them from seeds? It usual takes about 5 to 8 years to grow an aronia plant from seed to flowering if growing conditions are optimum. The time required will depend on the length of the growing season, the number of sunny days (light intensity), rainfall (irrigation), soil structure, soil texture, soil nutrients (fertilizer), and other factors. It may take 2 to 3 years or longer to produce a seedling of field-planting size (6 to 8 inches tall). The seedlings are then big enough to transplant from the greenhouse or outdoor seedbeds to a permanent location in a field or landscape. With optimum growing conditions, it will then take another 3 to 5 years for the seedlings to reach a large enough size (3 to 4 feet tall) to flower and produce a pound or more of aronia fruit. A few plants may go through their juvenile or vegetative phase faster and begin flowering sooner. I start my aronia plants from seeds in a early spring and they are 15 inches tall. I'm very happy to see them grow so much in their first couple months. Tomorrow I'm going to plant them in to a permanent location and I hope they will survive the winter. This information is informative and thus it interprets about many more things, as well as it is very well done too. so please share some more information too. If i plant seeds directly into a field in the fall with irrigation, that was prepared with a year of cover crops which produce a lot of mulch/aboveground biomass, do you think the aronia's would germinate effectively enough for permanent rows? What could be a minimum seeding rate per foot to get adequate spacing? I understand this is impossible to know, but can you take a guess? Thank you so so much for all the valuable information you have shared! Excellent incredible blog layout! How long have you been blogging for? you make running a blog look easy. The overall glance of your website is magnificent, let alone the content! Yes, that is possible if the seeds are planted correctly, germinate, and grow. All of this depends on the care they get. For more information about aronia, visit our website by clicking on the photo above. Is it chokeberry or chokecherry? What do aronia berries taste like? How far south can aronia be grown? Are you an Aronia Berry Fan? Click on the photo above to learn more about aronia or click on the word "Follow" above the photo to automatically get updates to this website. Rabbit Lists Link is Fixed - Thanks to comments from friends, I have now fixed that link to The Rabbit Lists. Hop to it! Click on the word "Follow" below to automatically get updates to this website. Our family owned business provides advice and services to gardeners and businesses about gardening, aronia berries, herbicide drift, expert witness, business plan & grant writing, hands-on workshops, and PowerPoint presentations. Confidentiality -- Everhart Horticulture Consulting (EHC) respects the privacy of our clients. If you provide EHC with personal information it will be held in confidence. EHC does not sell, lease, rent, or share our client's individual personal information or business information without explicit consent from our clients. EHC may tally but does not record site visits, cookies, or other personal information from visits to this blog or our website. EHC does not collect information via this blog or our website to share with other programs, agencies, individuals, or businesses. EHC is committed to providing a secure, sharing, user-friendly, and mutually beneficial relationship with our clients. Endorsement - References, advertisements, and links to this blog and our website do not imply endorsement or approval of products, processes, or services by Everhart Horticulture Consulting (EHC). This non-endorsement policy includes all products and services other than those offered specifically by EHC. Any reference on this website to any other products, processes, or services does not constitute or imply an endorsement by EHC. Liability - Everhart Horticulture Consulting (EHC) assume no liability for inaccuracies, misstatements, errors, or outdated information on this blog or our website. Everhart Horticulture Consulting (EHC) does not makes any warranty, express or implied, for the accuracy, completeness, or usefulness of any information, advice, or services included on this blog or by email, telephone, Skype, or during in-person consultations, or on other websites, blogs, or documents that are linked to this blog. The views and opinions expressed or implied on this blog do not necessarily reflect the views or opinions of EHC. Everhart Horticulture Consulting - In the statements above and everywhere else on this blog and on our website, the name "Everhart Horticulture Consulting" and the abbreviation "EHC" refer to Eldon Everhart, Lindsey Everhart, Sydney Everhart, and all owners, partners, and employees of this business. Dr. Eldon Everhart has helped hundreds of Master Gardeners, college students, and horticulture business people. As a horticulture specialist with Iowa State University, he wrote numerous Extension and research based publications, as well as hundreds of articles for gardening magazines and newspapers. He is a well known speaker at garden shows, conferences, and workshops throughout the United States and abroad. Dr. Everhart is currently co-owner of Everhart Horticulture Consulting business. In 2010, he consulted on mechanization of processing tomatoes in Egypt. He helped honeydew melon growers in Azerbaijan and has consulted on aronia berry production in Canada, China, Columbia, Greece, Romania, and South Korea. Hundreds of commercial aronia growers in the United States have consulted with Dr. Everhart. He helped start the Midwest Aronia Association and is a charter member. Copyright by Dr. Eldon R. Everhart -- All rights reserved. Plagiarism of this site is prohibited. Watermark theme. Powered by Blogger.